Two WHPK alumni carve out a record-shop niche. John Schauer and Rick Wojcik pick tracks in their shop. Rifling through the bins of obscure funk, soul, and international releases at Chicago’s Dusty Groove record store is a sweet thrill for crate diggers. They come from as far away as Finland and Japan to run their hands over the latest basement recording of soul sensation Peven Everett or a 1967 gem by Polish bossa novans the Novi Singers. But Dusty Groove, officially started in 1996 by Rick Wojcik, AB’88, and John Schauer, AB’86, first flourished in the virtual realm—the lofty, light-filled physical space came much later. Wojcik, an English major, and Schauer, who studied statistics, met as undergraduates while working at the University’s 100-watt FM radio station, WHPK. 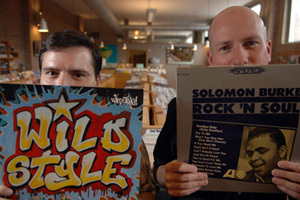 Wojcik ended up managing the station, and Schauer slung discs as J. P. Chill for a seminal hip-hop show in then-rap-starved Chicago, where house music ruled. “It’s almost impossible to think of now, but if you were walking down the street and you heard hip-hop coming out of someone’s car, it was like, ‘That must be a long-lost relative—I must know this person,’” says Schauer, who still helms the Friday night show. By the time they’d graduated, the pair had amassed personal record collections that would make a popular-music historian drool. Schauer got a fund-raising job at the University while continuing to DJ, and Wojcik worked in several Chicago record stores and traveled to England and Australia while working on a master’s degree in radio, television, and film at Northwestern, buying and selling imports to finance his penchant for globe-hopping. In 1990 the two embarked on their first cross-country road trip, just for fun. “We figured, we’ve never been to Memphis, we’ve never been to Louisville and Trenton and Passaic and Mobile and Philly,” says Wojcik. “We just tied it into record shopping.” In one “crucial” trip to New York and New Jersey in December 1995, says Wojcik, “I had this little Toyota, and it was just scraping across the Appalachians with records and it was the middle of the night. We said, ‘What are we going to do with all these records?” The pair set up a Web site to sell their finds. Powered by a four-year-old PC, in April 1996 Dusty Groove was up and running out of Schauer’s Hyde Park apartment. Within six months the two hired their first employee and expanded their digs to an apartment that faced an alley behind a fruit store. Makeshift desks were fashioned from Dell computer boxes left over from Schauer’s workplace, the University’s development office, where he ran the phone room. The store opened with limited hours. A drive-through window with a buzzer appeased customers who stopped by when the shades were pulled and the doors locked. Today the spacious first-floor shop is open from 10 a.m. to 8 p.m. daily, but 95 percent of the $4 million/year business is still done online. Wojcik, who prides himself on listening to every disc before offering it for sale, says that during a typical week he writes upwards of 100 disc reviews for the site. Competition from sites such as iTunes hasn’t affected Dusty Groove, he says, because it’s so specialized. He fears a future, however, in which iTunes and other corporate sites carve out exclusive distribution deals with record labels. For now Dusty Groove maintains its niche. This past May the Web site’s “New this week” offerings included a re-pressing of a 1964 spaghetti Western sound track by classical guitarist Francesco De Masi, obscure late-1970s soul by Chicagoans Jerline and Friends, and a compilation of recent French underground pop. “Working here, I realize there’s something great in just about every record that’s ever been recorded,” says Wojcik. “If some guy managed to get in a studio, turn on a microphone, roll some tape, and take it to a pressing plant and press it up, there’s probably some merit there.” Spoken like a true crate digger.